Let your skin become young-looking and beautiful again! 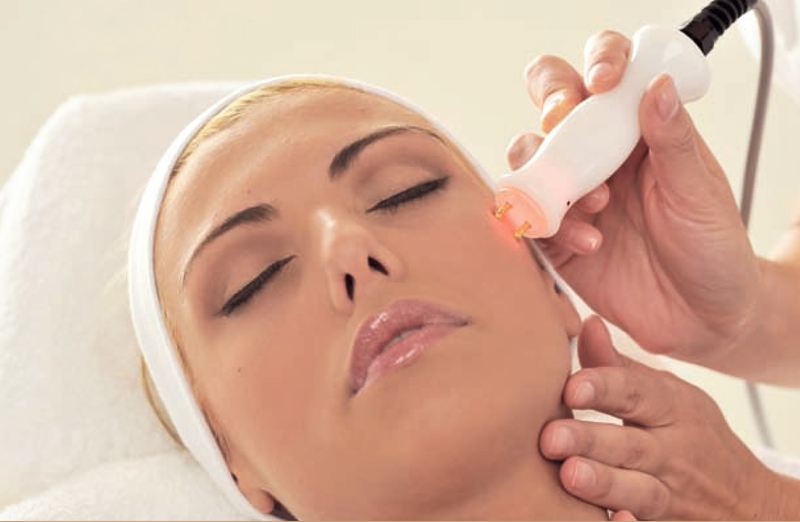 Microcurrent therapy makes your skin perfect without any injections! You don’t want your skin to age but are afraid of “beauty shots”? Your post-acne is irritating? Or you are tired of struggling against edemas on your face and under eye dark circles? Do you want your skin to be fresh and radiant? Have a course of microcurrent therapy! forget about under eye dark circles and pouches. And you will not be able to help admiring your reflection in the mirror. We promise that your facial skin will be lifted and will become firm. Your facial contours will become more distinctive. You will get prettier right away — our equipment provides the effect which can be seen after the very first session! You will see the effect of the microcurrent therapy at once because we use Bio-Ultimate Gold, a unique American machine. This is expensive equipment which costs a few hundred thousand rubles, and not every clinic can afford it. Why should you pay attention to equipment when choosing where to have microcurrent treatment done in Moscow? Imagine that you found microcurrent treatment at a very low price. You have had a few sessions and see no effect. As a result, you are disappointed in microcurrent therapy meaning that you will deprive yourself of this no-needle and non-surgical method of skin rejuvenation and treatment. Unfortunately, this situation is not uncommon because cheap machines of domestic manufacture are used in most clinics and salons. We have been practicing microcurrent therapy for a few years and we are sure of the result. So, we provide a 100% money back guarantee to all our customers. It is quite simple: if you do not see any improvements after a few sessions, we give your money back to you. Our staff consists of experienced beauticians who will make a personalized microcurrent treatment program for you. There are 17 programs, 54 subprograms and 11 levels of exposure available with Bio-Ultimate Gold, plus beauticians can program the device themselves to get the desired effect. 50% of the microcurrent therapy effect depends on beauticians’ qualification. We advise you to pay special attention to doctors’ expertise when looking for a place to have microcurrent treatment done in Moscow. All our beauticians have higher medical education and have been additionally trained in operating Bio-Ultimate Gold equipment. Click here to view our beauticians’ certificates and diplomas. You can easily get to our clinic which is located in the very center of Moscow. There are several subway stations within walking distance of the clinic: “Pushkinskaya”, “Mayakovskaya”, “Novoslobodskaya” and “Tsvetnoy Bulvar”. For drivers there is a large convenient parking lot nearby. Is it cheap or expensive? You can calculate yourself. The effect of a microcurrent therapy course lasts for about 8 – 12 months, so your expenses for it will amount to only 1250 – 1500 rubles per month. This is the amount that you probably spend on anti-age creams and face masks which do not provide the result you need, while microcurrent therapy will produce the effect you will see after the very first session! Do you still hesitate? Just contact us at 8 800 700-72-87 to book a session or place your request on the website and see for yourself how efficient the microcurrent therapy is!